With distance measuring devices being common place now you’d think golfers would not be short of the pin as much as they are. 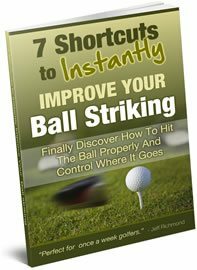 Think back to your last game of golf and add up how often you were short of the pin. Imagine how many shots you could save if you got the ball to the hole more often. Some people will tell you that you’re under clubbing and that’s why you’re hitting it short. If you don’t know your distances very well there could be some truth to that, but I think there’s a bigger reason why most golfers end up short of the pin. I think for most golfers, they have a fear of hitting the ball past the pin. Like there’s some sort of monster past the pin. 🙂 Which is odd because most golf course architects put most of the trouble in front of the green. Generally, I DON’T think the solution to this “coming up short” problem is selecting one more club. Because often when I see golfers do that they are still often short of the pin with the longer club. Instead, I think there should be a mind game you play to help you hit shots up to the pin more often. To help you do this, the next time you play golf I want you to stand behind your iron shots and imagine your ball flying over the flag by 20 – 30 feet. Make a conscious effort to do this on every shot where you have a good chance of getting to the pin. Be very detailed with your visualization and see the ball flying further than the pin. Then when you’re over the ball and looking at your target look beyond the target by 20-30 feet, like you did when you were standing behind the ball. Then make an aggressive swing. 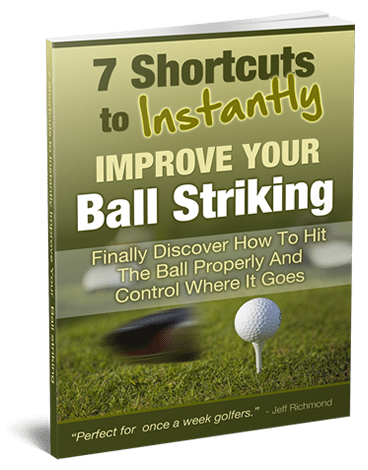 Try this out the next time you play golf and I’m sure you’ll be shocked at how many more times you’re pin high. This will help you score no end because, like I said in the beginning of this email, most trouble is short of the hole.